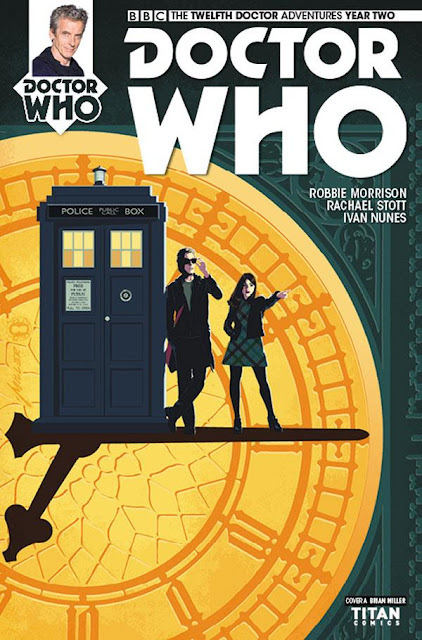 Titan Comics: Doctor Who - THE TWELFTH DOCTOR #2.4 Review | Warped Factor - Words in the Key of Geek. Tony Fyler loosens his old school tie. The payoff here has more than a whiff of Classic neutron-flow polarity-reversal about it, but also involves bringing in the UNIT troops, in the manner of some other classic stories, like The Seeds of Doom, Terror of the Autons, The Daemons and even Terror of the Zygons (side note – you’re going to love the contact-photo of Kate Stewart on the Doctor’s phone). There’s also a healthy dose of ‘here’s something I knocked up earlier’ MacGuffinry in the defeat of the fantastic returning villains of Ravenscaur, and, importantly, the shivers in this story aren’t just about them. In fact, the returning villains are mostly about stompy bluster and speeches of their own superiority in this issue, whereas the genuinely creepy stuff takes us right back to the beginning of the story, evoking some classic sci-fi tales like Invasion of the Body Snatchers and Children of the Damned. In essence, you could pretty much substitute the Twelfth Doctor and Clara with the Third Doctor and Jo Grant in this story, and you’d still have pretty much the same structure, though there’s a signature bit of Twelvish tomfoolery with a stuffed fish that you’d never have caught Jon Pertwee getting involved in. But the Pertweean sense of pace, of a scale of villainy that threatens the whole human race with extinction from a base on a remote Scottish island, and of the Doctor’s exasperated hopelessness with the warlike determination of the villains, when another way would surely have been possible, all survive nearly forty years intact and could clearly be used in the time of the Twelfth Doctor without anyone raising a single attack-eyebrow. In fact, the thing that most distinguishes this story as belonging to the 21st century is the moral arc and the way the villains justify their actions. Morrison uses this particular villain, and the particular nature of their plan in this story to deliver a moral here which challenges the Doctor’s faith in our fundamentally stupid species. The Twelfth Doctor, like many of his previous incarnations, argues that the human race has much to recommend it, and that co-operation with us as a species would always be possible, that our potential outweighs our primitivism. But the creatures at the heart of this story have lived among us, and as such are able to deliver a blistering counter-argument, in which we stand accused of all our pettiness. It’s an indictment to which the Doctor has no real answer but to insist on his rightness and move immediately along, despite of course going stark raving mad and more often than not insulting us himself when during the Pertwee era he had to make the commitment these creatures have made, to live among us on a semi-permanent basis. In a way, the creatures here are more convincing and more justified in their hatred of us, having lived with us as planetary room-mates, than the Doctor is with his dilettante dropping-by and his notional, almost abstract faith in the human race. It’s a grey area that would rarely have been allowed in the old days, but it makes the adventure more effective here, and the moral lesson of the story sharper in its condemnation of the ills we still allow to proliferate in the 21st century. Pace-wise, it’s an interesting issue, this one, as it brings several strands together, and strives to maintain a sense of ever-increasing peril in all of them, meaning the difference of scale between, say, the routing of a naval attack and the bullying of a couple of teenagers by three children of the damned can make the various peril-points feel uneven on the way towards a final climax which threatens to drop Scotland into the ocean (with more than a quip about devolution) and the aforementioned polarity-reversing act of union-maintenance. That said, what you end up with is plenty of peril on different levels, leading to a sequence of things to worry about on all of those levels, and lots for all our heroes to do – Clara leading an evacuation and doing a bit of Doctor-rescuing along the way, while the Doctor himself takes on the leader of the villains, and does something terribly, terribly rash, which of course makes it handy that Clara’s in a recuing mood. While the different threat-levels means there’s not a smooth change up through the gears of peril, there are several scenarios to switch between, as you would in a high-octane on-screen final episode, leading to resolutions all along the line, peaking in individual moments of tension and terror, that do more than satisfy. What you end up with here is a comic-book which you close with a smile and a sigh and just possibly the popping of a trouser button or the loosening of a belt. It’s been a Thanksgiving or a Christmas dinner of a story-arc, this one, rich, juicy and full of treats, and it gives you that same sense of satisfaction to have finished it, knowing you’ll probably go back for seconds at some point, once you’ve sat a while and taken it all in. Everyone has their own favourite artistic styles, and Rachael Stott, working with colourist Ivan Nunes here, delivers what is one of mine – precision-rich, highly detailed, sharp-lined work that treats boring space as an anathema (see also Lee Sullivan, Neil Edwards, Mariano Laclaustra etc for other classy practitioners of the style). Stott gives every panel something interesting to draw the eye, while pushing along the pace of the storytelling, and really selling what could be just a complex, gorgeously idea-rich story as a visual spectacle fitting the return of this particular species of villain. Different considerations and realities apply of course, but a TV version of this story could do far worse than sticking to Stott’s vision, which steals the reader’s breath where it should, and leaves you punching air en route to the Thanksgiving satisfaction. Nunes of course we know from two years of work on Who comic-books at Titan, and he has yet to hit a bum note. Nor does he drop the ball here, continually pushing the pace and the richness with colourwork and a sense of light that makes the whole thing live. 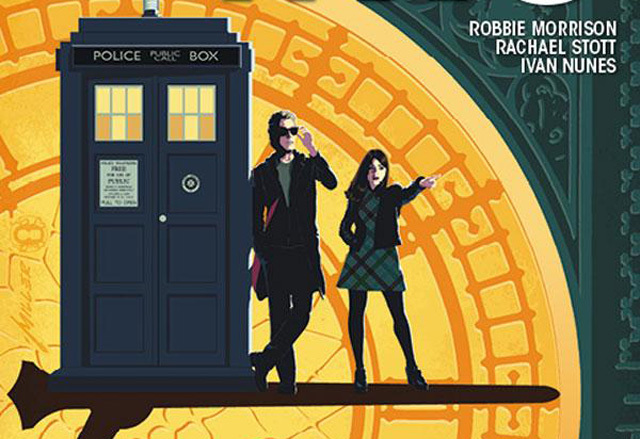 Clara Oswald and the School of Death (yep, sorry Robbie, still hate that title, however tongue in cheek it might be) has been a proper punch in the face to wake up your expectations for the second year of the Twelfth Doctor in two dimensions. It’s seen the dramatic return to the Who universe of a Classic villain not always well-served on screen. Serve them on-screen in the 21st century as Morrison, Stott and Nunes render them here and there’d hardly be a fan who wouldn’t applaud you. The Twelfth Doctor is much more Series 9 in this story, the cool codger, the Captain Jack Sparrow’s irresponsible old uncle character that pushes Hartnell, Pertwee, both the Bakers and a smidgen of McCoy into a glorious attack-eyebrowed combination and then, of course, adds a sprinkle of pure Capaldi skill into the mix, just for swagger. While we can only assume that Clara is now a thing of the TV past, the School of Death gives her one of her finest two-dimensional hours. Get The Twelfth Doctor #2.4 now, have a good solid revel in all its wonders, and then appreciate the punch and the power that Titan has brought straight out of the gate to launch the second year of the Twelfth Doctor. What in the universe will they bring us next?